This very pretty embellishment can add a touch of luxury to any of your designs. It comes in many different styles, colours and widths. 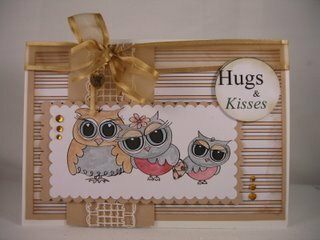 This Owl card has the Rafia Lace added under the image panel. This is a finer lace and it has been wrapped around a separate panel with some ribbon over the top. It will hide where the panel joins the main card. I find it better to work on a separate top layer first and then add that to the base card. 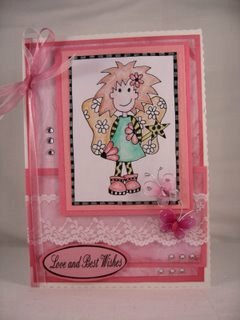 The image panel on this card has had the ruffled lace added around the edge. I have used a strong double sided tape to hold it in place but you can add it with a glue gun if you prefer. And again because the panel is separate from the base it will hide all that ugly tape from view. 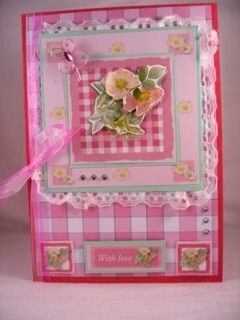 Extra Organza ribbon has been added to the spine of the card for an added effect. Lace can also be a useful addition to cards for the men in your life. Rafia Lace is reasonably cheap and can be bought from the Gardening section in your craft shop or Garden Centre. It is a good addition to male themed cards because it is not the ornate type of lace and it can be used for any occasion. 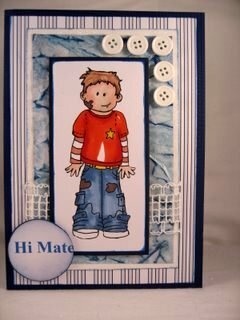 The buttons and the Distressed background paper will keep the look rugged enough. And if you don't want to add the real thing then Paper Lace is an alternative you may like to consider.